What do Rachel Zoe and a handful of female politicians have in common? They like this shoe, as The New York Times, half-shamefacedly, informs us today. Trivializing, or refreshing perspective on women in politics? It's the Kate Spade Halle high-heeled wedge, retailing for just under $300. In New York, Reshma Saujani, who's running against Democratic Representative Carolyn Maloney, and attorney general candidate Kathleen Rice are fans, as is "the chief of staff for a prominent woman in Congress," who didn't want to be identified and "someone who worked for Hillary Clinton." I know. We, the news media, are not supposed to ask female candidates about their hairstyle or their choice of pantsuits over skirts or their shoes. It is irrelevant. It is trivializing. It is sexist... 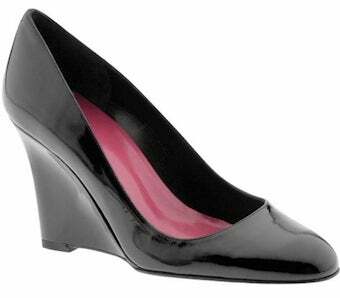 But the Kate Spade wedge heels are not just one candidate's shoes. They seem to be the shoes of a circle of younger women aspiring to power or already in it, women directly and indirectly passing on to one another ways of navigating the particular challenges of being a woman in the public eye. A woman must look put-together, but not as if she is a slave to fashion; she must look groomed, but never be spotted grooming. Even with the meta-analysis, it's hard to shake the feeling that it all is a sexist distraction, even when done by a woman who knows how to talk the talk. This is not about some sort of gag order imposed on tiptoeing journalists. It's a small but vocal pushback in a world where until very recently, Hillary Clinton's pantsuits and "larger bottom" were considered valid subjects to debate. Barbara Walters Bodysnarks Hillary Clinton&apos;s "Larger Bottom"
Yes, it's trivializing if it's not digested in its full context — and it's also trivializing if a societal standard persists that women must simply slip into their suit separates and never speak a word of it. it doesn't have to be trivial. We all know voters want candidates they can relate to. ("Beer summit," anyone?) But women who just magically walk around all day, every day, for hours at a time, in heels, without ever limping, complaining, or bandaging their blisters, and *never* talk about their shoes? Not relatable. I also think it's awesome that these same women not only have pretty good taste in shoes but are also out there spending 99.9998% of their time on things of tremendous substance and significance.